Terex Cranes has launched the Terex Liftplan – a free online lift planning tool for customers’ lifting operations. 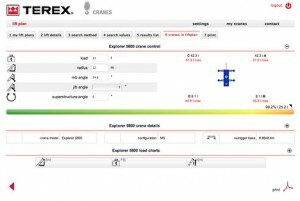 Users can select from a range of Terex cranes and specify the load, height and radius of the lift involved. A copy of the lift plan is then available to print out. The lift planning tool can also be used on site on an ad-hoc basis, so should conditions change, the driver simply enters the new information and the system automatically recalculates. The new tool is available in nine different languages, uses either imperial or metric units and employs a variety of different methods to determine the best machine to deliver safety, performance and productivity on site.